insert text and click search. To access more information click on the photograph and you will be taken to the photographs detail page. To place a photograph in your shopping cart, select option and quantity then click the ADD TO CART button. You may view items in your shopping cart, and proceed to checkout, by clicking the cart icon in the upper right-hand corner of the page. You can add photographs to your shopping cart or remove current items at any time. When you're ready to complete your order, be sure to review all of the items you've placed in your shopping cart. If you decide that you don't want a particular photograph, click REMOVE ITEM. Once you have all the items you wish to purchase, click the CHECKOUT button. 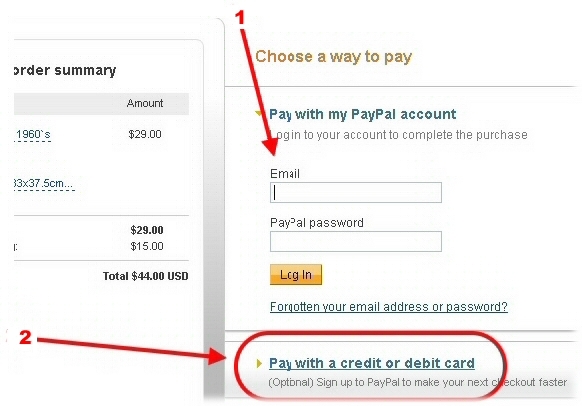 (This will take you to PayPal's website for card processing). option 2 pay by credit card, towards the bottom of the page look for the "Pay with credit card or debit card" or "Pay as Guest section" and click continue..